Crews poured 800 worth yards of concrete onto the deck of the Margaret Hunt Hill Bridge on Friday. 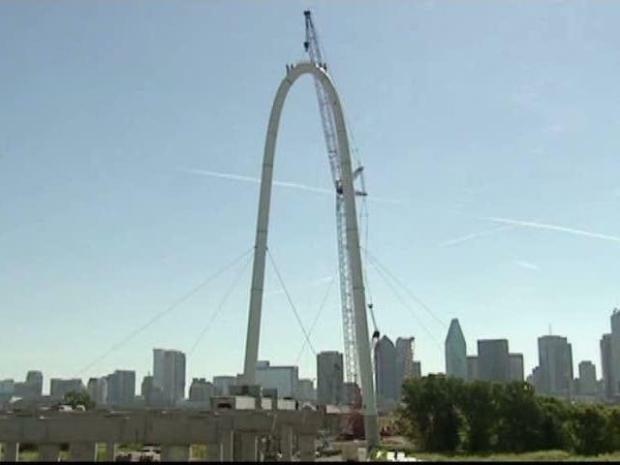 When completed, the Santiago Calatrava-designed bridge will connect West Dallas and North Oak Cliff with downtown Dallas. The bridge will run down Continental Avenue, connecting Woodall Rogers Freeway to Singleton Boulevard. The Texas Department of Transportation expects the bridge will be complete by the end of this year. 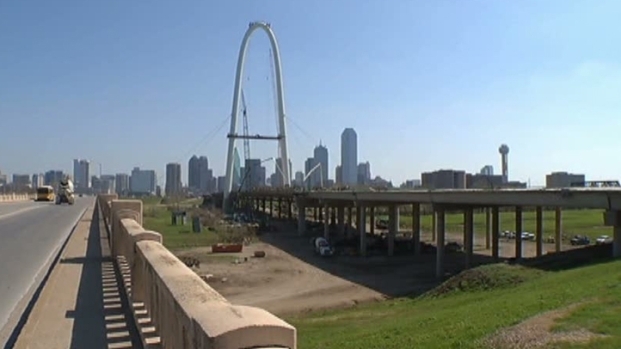 It's part of the $2 billion revitalization Dallas Trinity River project. TxDoT crews began pouring concrete at 7 a.m. Mixing trucks were on the ground under the bridge, and a large machine used a long pipe to pump the concrete onto the deck above. The Margaret Hunt Hill Bridge gets concrete. Some of the buildings to the west of the river have been newly renovated, and some businesses claim they’re thriving. Jack's Backyard opened in October of 2008, and owner Kathy Jack said 2011 has already been a record-breaking year for the eatery. She said she’s also heard rumblings about several new businesses popping up in her area. "We’re hearing things all the time they're starting to talk about developing things next door on both sides of me," she said. "Actually, there's some more businesses coming out all the time, so I think that south Dallas is going to have a renewal from all this." The Calatrava Bridge Is Up, But What About the Rest? The new Calatrava bridge will extend Woodall Rogers Freeway to West Dallas, but some drivers want to know when the old freeway bridges will get fixed. The I-35E bridge that state engineers said needs replacing is tops on their list.